While the speed which Hemaron offers relief from hemorrhoid pain is not impressive, the manufacturer’s strategy can be acknowledged. Though two weeks may be a long time to wait for any medication to take effect, the treatment that Hemaron offers is designed to address hemorrhoid pain in a long-term and root-based approach aimed at eradicating hemorrhoids at the cellular level. Hemaron is a long-term medication that will alleviate pain and swelling by strengthening vein tone and promoting capillary health. The end results will vary, with some users needing to repeat use of the product in the event that vascular health degenerates and pain and inflammation return. Hemaron is made of all natural ingredients that are known to be rich in antioxidants which further aid circulation processes. 900 milligrams of sophara japonica extract. Japanese pagoda tree extract has been scientifically proven to normalize and strengthen the walls of veins and capillaries. 300 milligrams of horse chestnut extract. Horse chestnut both promotes vascular circulation and strengthens connective tissues. 150 milligrams of grape seed extract. Grape seed extract is rich in antioxidants which help to prevent cellular degeneration. Hydroxypropylmethylcellulose. This compound is typically used as a coating agent. Magnesium Stearate. This compound is often used as an anti-adherent to keep tablets from sticking to equipment and is considered safe for human consumption in levels not exceeding 2500 mg/kg per day. There are no known side effects reported from the use of Hemaron. The recommended dosage is divided into three subgroups which are dependent on the patient’s symptoms. Light symptoms result in a recommended dosage of 1 tablet, three times a day; while moderate symptoms result in 2 tablets, three times a day; and finally severe symptoms require 3 tablets, three times a day. Remarkably, Hemaron suggests that all users begin treatment with the heavier doses in order to achieve more dynamic results. 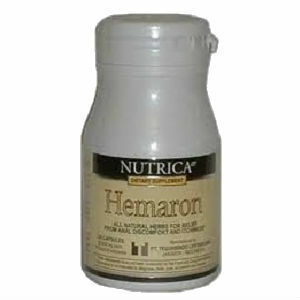 Hemaron comes in bottles containing 90-120 capsules and can be purchased online for approximately $33.00 per bottle. If you take the recommended dosage, then your first bottle is basically a month’s supply. However, remember to consider the price of the necessary “temporary relief” medication that will likely be needed to supplement Hemaron, as it takes two weeks to effectively build vascular tissue in order to free yourself from pain. The Hemaron guarantee is fairly narrow in that it states that the manufacturer will only give a full refund if you don’t start seeing improvement after sixty days. This return guarantee doesn’t cover shipping and handling, and the consumer must return the unused product or the empty bottle it came in. John Parker	reviewed Hemaron	on September 3rd	 and gave it a rating of 2.